When you want to reveal cells that may reside in hidden rows or columns, it can be difficult to locate them. The approach is to first select all visible cells in the worksheet, which also will reveal hidden rows and columns. For more information about displaying hidden rows or columns, see Hide or display rows and columns. Or on the Home tab, in the Editing group, click Find & Select>Go To Special. Under Select, click Visible cells only, and then click OK.
All visible cells are selected and the borders of rows and columns that are adjacent to hidden rows and columns will appear with a white border. 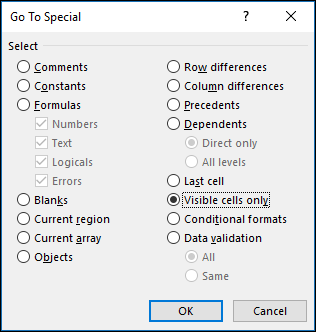 Note: Click anywhere on the worksheet to cancel the selection of the visible cells. If the hidden cells that you need to reveal are outside the visible worksheet area, use the scroll bars to move through the document until the hidden rows and columns that contain those cells are visible.